By Marielle Pariseau in Blog, Featured on December 2, 2013 . When I first started with CAMBRA 12 years ago, I decided to do it because I knew it was the right thing to do. I had been doing everything for my patients that I was taught to do, and they continued to get new cavities, my restorations failed and I was finally ready to admit that what I was taught in dental school wasn’t working. I knew there had to be a better way to treat the disease, I just didn’t know where that would lead. At the time I actually had thoughts that if CAMBRA really worked well, I might be slowly putting myself out of business. I was okay with that thought because I figured I’d slow down and eventually retire, so perhaps that would work out okay anyway. Foremost, I just wanted my patients to stop getting cavities. I had some successes and some failures along the way, but an interesting thing happened. The patients that I was able to get healthy suddenly wanted to do more restorative care. I continued to get busier, my practice continued to thrive, even through the recession. That’s when I began to understand what Bob Barkley had tried to teach us 40 years ago, patients don’t really start doing dentistry until they stop getting cavities. 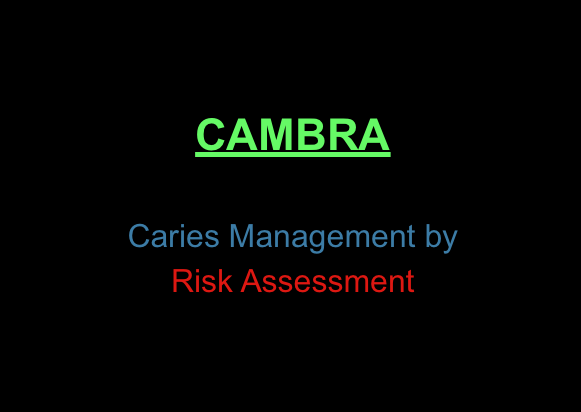 CAMBRA is probably the single biggest practice builder I’ve experienced in 34 years of practice. CAMBRA will ultimately make a practice busier and more successful, but the true value is in the improved relationships with patients. When you truly have their best interest at heart, and express to them that you are interested in helping them stop their decay cycle, they have a much deeper trust in you. The greatest value is in helping people get healthy and developing a great relationship with them in the process. That makes practicing dentistry much more personally satisfying and rewarding. Having great relationships with your patients is always a great thing. They appreciate you more and tell you, and they spontaneously refer their friends and family to you. In fact they insist that people come to see you. So now I routinely have patients travel several hours to see me. It’s a wonderful feeling knowing I can help these people. Dental caries is an awful disease. V. Kim Kutsch, DMD received his undergraduate degree from Westminster College in Utah and then completed his DMD at the University of Oregon School of Dentistry in 1979. He is an inventor, holding numerous patents in dentistry, product consultant, internationally recognized speaker, past president of the Academy of Laser Dentistry and the WCMID. He has also served on the board of directors for the WCLI and the AACD. As an author, Dr. Kutsch has published dozens of articles and abstracts on minimally invasive dentistry, caries risk assessment, digital radiography, and other technologies in both dental and medical journals and has also contributed to several textbooks. He acts as a reviewer for several journals including JADA. Dr. Kutsch serves as CEO of Oral BioTech. As a clinician, he is a graduate and mentor in the prestigious Kois Center and maintains a private practice in Albany, Oregon.